$97.762 thousand on 9 screens. 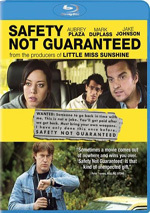 According to the Blu-ray’s press materials, 2012’s Safety Not Guaranteed boasts an “all-star cast”. Here’s who’s in the film: Aubrey Plaza, Mark Duplass and Jake Johnson. No offense to those actors, but if that’s an all-star cast, I’m Roger Ebert. Publicity hype notwithstanding, Safety sounded interesting so it wound up in my player. 20-something introvert Darius (Plaza) lives at home and works long hours at a demanding magazine internship, so she lacks money – and much of a life. When the publication receives an odd classified ad from a guy who seeks a partner for time travel, staff writer Jeff (Johnson) proposes a story on it. Editor Bridget (Mary Lynn Rajskub) agrees, and the cocky Jeff takes on Darius and nerdy, overachieving intern Arnau (Karan Soni) to work on the story. This sends them on the road to investigate, so they head to Ocean View, Washington. They stalk the advertiser’s PO Box and eventually find Kenneth (Duplass), the mystery man who ran the message. They pursue and eventually contact him. Jeff fails to make inroads, but the quirky Darius manages to connect with oddball Kenneth. We follow the development of various relationships as well as any potential time travel. In the past, I’ve been critical of many “indie” films because of what I perceive as their tendencies to be different simply for the sake of being different. Much of the time, they pursue oddness for no logical goal other than to seem edgy or cool; they can be just as predictable as stale as “Hollywood” films but attempt to convince us otherwise. Safety walks that proverbial fine line between stupid and clever and often threatens to stumble on it. It sometimes pursues the self-consciously quirky route that could become annoying but doesn’t. The movie’s oddness leans toward the “funny” side of the street and seems clever rather than contrived. The film also manages to balance its low-key humor with its drama well. While it starts with a definite Napoleon Dynamite feel, it becomes more real as it progresses and delivers surprising heart and emotion from its drama. Given its quirky beginnings, the serious parts could’ve felt tacked on or fake, but they mesh with the humor in a surprisingly clean, effective manner. The actors fill out their roles well, even when they follow predictable paths. Plaza – who I remember best as the deadpan Daisy in Funny People - handles the snarky lines with aplomb but also manages to give the character depth and growth. The others aren’t quite as good, but they’re more than sufficient to fill out their roles. In the end, Safety delivers a sweet, engaging fable. It comes with some trite elements but it throws in enough surprises and warmth to make it worthwhile. Safety Not Guaranteed appears in an aspect ratio of approximately 2.35:1 on this Blu-Ray Disc. This was a consistently positive presentation. In terms of palette, Safety went with a mildly stylized palette. Some shots opted for a light golden tone, while others had more of a teal impression. None of the tints seemed dominant, though, so they didn’t stand out in a negative way, and the colors were well-rendered. Blacks showed good depth, while low-light shots boasted nice clarity. Though I thought the image was a little below “A”-level standards, it still was more than satisfying. As for the film’s DTS-HD MA 5.1 soundtrack, it worked pretty well. The audio tended to be somewhat restrained most of the time, but some sequences – such as at a football game or at shooting practice – opened up the spectrum in a satisfying manner. Cars and other elements moved around the room, while other effects added a good sense of ambience. Only a handful of extras appear here. A Movie Making Mission goes for 15 minutes, 16 seconds and provides notes from director Colin Trevorrow and actors Aubrey Plaza, Mark Duplass, Jake Johnson, and Karan Soni. “Mission” looks at script/story/characters, cast and performances, music, props, and some shoot specifics. “Mission” is too short to be a deep program, but it includes a decent number of details and insights. The Ad Behind the Movie lasts two minutes, 18 seconds and features author/original ad writer John Silveira. He talks about the classified that inspired the movie’s story. It’s a brief but informative piece. The disc opens with ads for Looper, Robot & Frank, Playing for Keeps, and Now Is Good. These also appear under Previews. No trailer for Safety shows up here. Despite its occasional threats to become too quirky for its own good, Safety Not Guaranteed works well during most of its running time. The film mixes interesting characters, quality performances and a nice mix of comedy and drama. 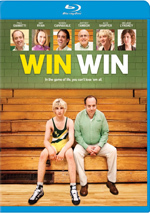 The Blu-ray provides solid picture and good audio but lacks substantial bonus materials. The absence of supplements puts Safety in the “rental” category, but it remains a movie I recommend.